Bullmastiff dog is a pure dog breed which originated in Great Britain. 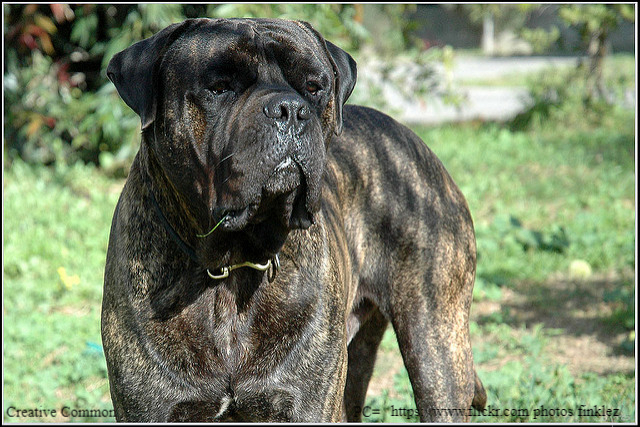 This desirable dog breed was produced by the crossing of two dog breeds named, Mastiff dog and Bulldog. A Bullmastiff dog contains the characteristics and traits of both breeds. The Bullmastiff dog appearance is a quite charming and appealing. It can be easily distinguished from other dog breeds on the basis of its appearance. Let us have a complete guide about the Bullmastiff dog regarding its appearance, nature, and characteristics. All the queries such as what is a Bullmastiff look like, How big is a Bullmastiff dog and what kind of dog is a Bullmastiff would be satisfied here. What is a Bullmastiff look like? The Bullmastiff dog is a giant dog which was produced for the purpose of safeguarding its owner. They are brave, fearless and courageous dogs which leave no stone unturned in guarding their master and family. It contains short and dense coat which protects it from the harsh environment such as rain. This massive, majestic and strong dog has 3 acceptable colors of its coat. According to the AKC standard, the coat of Bullmastiff dog depicts fawn, red and brindle color. One must have a glimpse of a fawn Bullmastiff dog, brindle Bullmastiff dog, and red Bullmastiff dog in order to purchase the most attractive and adorable one. All of them have their own grace. Fawn Bullmastiff dog has a coat color in the shade of brown. It ranges from the dull brown to the bright or red brown color. Likewise, the red Bullmastiff dog contains the coat of light red color, rich red color or in between these two shades. Brindle Bullmastiff dog contains the adorable and glamorous strips of fawn and red color strips. It contains dark colored mask on its face. In addition to this, the Bullmastiff dog has dark muzzles and V-shaped ears. A Bullmastiff dog does not contain any white color on its body. However, the chest may contain little white markings on it. These are reserved, loyal and docile. It has large nostrils and black colored nose, which is wide in appearance. The skull contains black markings on it and is large and broad and wrinkled. These watchful dogs are intelligent, confident and independent. When it comes to snoring the Bullmastiff dog prove to be a pet troubling the people with loud snores. How big is a Bullmastiff dog? The size of dogs varies from breed to breed. Some are of moderate size while a few dog breeds are giant in appearance. 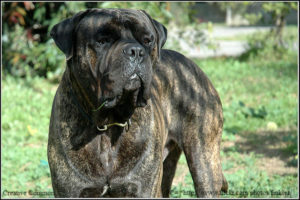 The Bullmastiff dog appearance exhibits it to be a large size dog. This desirable and popular dog breed is tall in appearance. The male dog usually depicts the normal height in the range of 25 inches to 27 inches. However, the female Bullmastiff dog depicts the average height of 24inches to 26inches. This majestic dog is capable enough to scare the enemy with its solid and strong body. The weight of a male Bullmastiff usually ranges from 110pounds to 130pounds while the female Bullmastiff depicts the average weight range from 100pounds to 120pounds. People who have chosen Bullmastiff as their pet are quite lucky as they do not have to combat the mess. Bullmastiff does not require too much maintenance. Their low maintenance saves the owner from the troubles. Bathe the dog when required. Use a good quality shampoo for the coat of Bullmastiff. It does not shed much like other dog breeds. Hence, one does not experience enormous hair here and there, in their home. Use a brush having a rubber curry for the brushing of the coat hair. Following these methods ensures the beautiful, adorable and glamorous look of Bullmastiff dog. Bullmastiff dog appearance grooms when owner works on the maintenance and hygiene of it. Regular brushing kicks out the debris, dirt, dust, and dandruff from the hair. 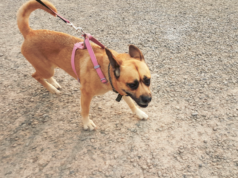 This reliable dog should be taken for regular walking and exercise. Avoid strenuous exercises as it may affect the health of the dog. In addition to this, balanced diet is also significant enough to ensure good health of Bullmastiff dog. What kind of dog is a Bullmastiff? A Bullmastiff dog is a heartthrob dog which perfectly acts as family guardian. It is a dog breed which is quite comfortable and friendly with the kids. Kids feel pleasure while playing with their pet. It is an alert dog which is quite loving and caring for the kids. It shows shy behavior towards the strangers. A Bullmastiff puppy is strong enough to protect you. It attacks the enemy with its full strength and bites it. The victim gets serious wounds and even experiences bleeding at the affected site due to the Bullmastiff’s bite. These are sensitive towards the unpleasant and extreme weathers such as winters and summers. Owners should take good care of them in such circumstances. 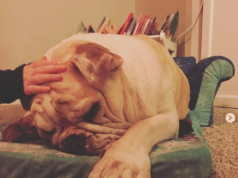 Handling it with care and providing extra care is beneficial in protecting the Bullmastiff from enormous health issues. 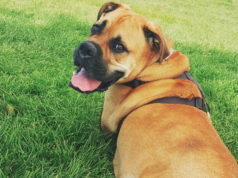 A Bullmastiff dog is prone to a number of health risks such as elbow dysplasia, flatulence, allergy, sunburns, lymphoma, sarcoma, hemangiosarcoma, hip dysplasia etc. The average life span exhibited by this dog breed is 8 to 10 years. However, the owners can increase the quality of life and lifespan up to some extent (for a few more years) by ensuring good health of their pet. Consulting the veterinarian on observing the signs and symptoms of abnormality is significant in this regard. Moreover, regular checkups and monitoring are necessary in order to get aware of any health disorder at the initial stage. They respond well towards the training and socialization. They are highly obedient towards the command of their master. It is better to consider training your pet at their childhood. It facilitates and eases both the owner and pet. Bullmastiff dog is relatively quiet and calm dog and does not cause trouble for its master. One can take it to parties and gathering. They are meant to be introduced to people with full confidence.